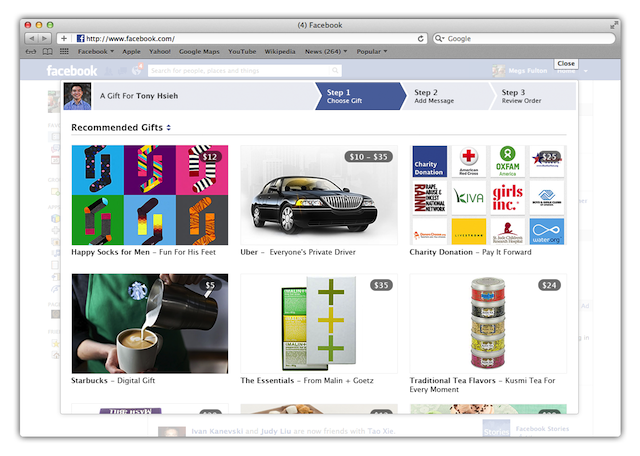 Facebook Gifts launched with the ability for you to buy something meaningful for a friend or family member on the social network. I’ve tinkered with it a bit and have bought a few gifts, including a bonsai tree and Starbucks gift cards. My mind immediately jumped to “wouldn’t it be cool if I could donate money to a charity on behalf of my friend for their birthday?”, and well, that happened today in a test capacity. If you have access to Gifts, you will now be able to choose from eleven non-profit launch partners who can benefit from a donation made on behalf of one of your friends. Do it for their birthday, their engagement, wedding or just because. It’s a genius idea, and one that really leverages Facebook’s over 1 billion users. This is yet another feature that shows the power of Facebook, similar to the Organ Donor program. During the test program, your donation will be limited to $25, but that may change over time if this is successful, I’m told. Don’t know which one to pick? Let your friends or family do the choosing. 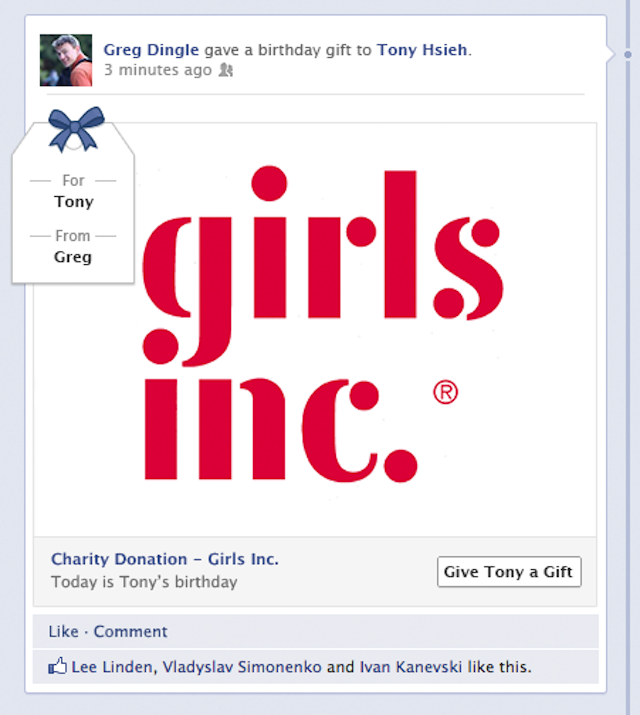 The Facebook Gifts product hasn’t rolled out to everyone just yet, but if you have it and give a gift to someone, they immediately get access to the features. The company tells me that it plans on rolling it out to more users proactively, as well. Here’s a special tip, if someone has given you a gift of any type using Facebook Gifts, you can “return it” before it ships or you use it, and then apply it to a charitable cause if you like. That’s really neat, because the sender won’t be offended at all by your decision. 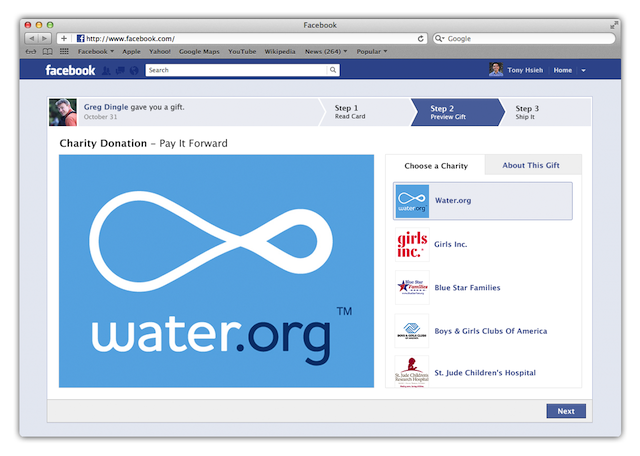 We believe that adding charitable giving to the Facebook Gifts platform will make it easier for people on Facebook to discover and connect with nonprofits that are doing important work around the world. In addition to aiding in the aftermath of the hurricane, we believe that making it easier for people using Facebook to give a charitable donation through Facebook Gifts will introduce many Facebook users to exciting and worthy nonprofit organizations they may not have discovered otherwise. We are very excited to be partnering with Facebook in this manner to allow users to make a donation to fight cancer (or other important causes) in honor of their friend’s birthdays. The Facebook platform can create true social change through this new initiative and we are honored to be a partner in the effort. Social change and gifts for a good cause. I like that. I also like that Facebook is using its power for good, thumbs up.